Luxury 5 star, self-catering holiday rental, sleeps and dines 12 (plus 2 infants and up to 2 small, well-behaved pets). 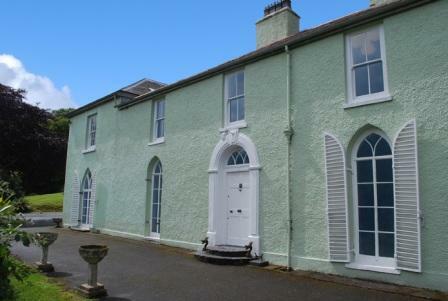 If you like to holiday in comfort and style, come and stay at Glandwr Country House, Tresaith. This beautiful, Grade II listed, Georgian country house, offers an excellent standard of accommodation. 4 double bedrooms (2 en-suite), 2 twin rooms and 3 family bathrooms. Set in over 7 acres of its own gardens and woodland, Glandwr Country House is only a few minutes from Tresaith beach which lies within the designated Marine Heritage Coast. The Ceredigion Coastal path is literally on our doorstep as well as cycle paths, water sports, horse-riding, and golf courses. The beautiful environment, heritage wildlife and Welsh culture, are all key features here. Bedrooms are beautifully decorated with either recently refurbished ensuite or private bathrooms. You will certainly sleep and rest well here – you’re sure to return time and time again.